David Hepworth's blog: The year is 2016 and Jimmy Webb's at number one in the States. The year is 2016 and Jimmy Webb's at number one in the States. 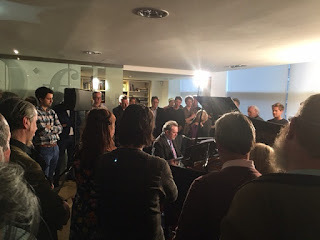 Jimmy Webb played a showcase at his publishers tonight. A few score people gathered around his piano as he did half a dozen songs, which included obscure requests as well as the ones that made him famous. I liked his patter. "People associate me with the 60s or the 70s if I'm lucky. But what you people don't know is I'm still relevant because one of my songs is at number one in the USA this week." He was talking about the use of his song "Do What You Gotta Do" in Kanye's hit "Famous". "It seems this record's about some beef that Kanye has against Taylor Swift. I didn't think that was very gentlemanly so I wanted to have it out with him, Okie to Okie. Then somebody said 'you know you're getting 35% of this record?' and I thought 'Taylor's a big girl - she can look after herself.'"